On Tuesday, the NBA announced its annual Noches Latinas, which pay tribute to Latin heritage. The New York Knicks will wear "Nueva York" jerseys during their March 12 game at Chicago and on March 14 at home vs. Portland. Knicks All-Star Carmelo Anthony, whose father was Puerto Rican, recently discussed his heritage with Martin Bater of ESPN Deportes. Carmelo Anthony is half African-American and half Puerto Rican. He was born and raised in the U.S., but the 27-year-old wears his Latin pride on his sleeve -- almost literally -- with a tattoo of the Puerto Rican flag on his right hand. 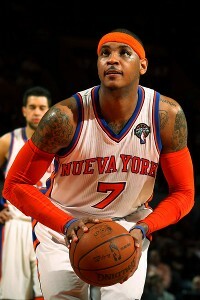 Carmelo Anthony and the Knicks will once again don the Nueva York jerseys on March 12 and 14. "I think it's something that's getting more and more out there. ... People are definitely starting to recognize that," Anthony said of his Latin heritage. "I'm still trying to get that message out there, to let them know that I'm one of them and part of that community too." Anthony's father, who was Puerto Rican, died when Carmelo was just two years old. Anthony may not have many vivid memories of his father, but Carmelo Sr. left something behind that Melo treasures. "[My dad] wrote poetry. I have a book full of poems that he wrote. The book is too heavy to carry around, so I leave it in my office, but I always try to go back and read them," said Anthony, who has a son, Kiyan, with his wife, La La Vazquez. Carmelo used to go to his late father's native country when he was a child, but the first visit he truly remembers was in 2002, while he was a teenager. Since then, the Knicks superstar has built multiple basketball courts in Puerto Rico with the ambition of fulfilling dreams for the nation's children. "I want people to know that dreams can come true, that whatever people want to do when it comes to sports and things like that is doable," he said. "I want to lead the charge and let them have hope, let them know that it is possible to make it to the NBA coming from [Puerto Rico]." Anthony, coincidentally, was part of the U.S. Olympic team that lost to Puerto Rico in the 2004 Summer Games. Anthony went 0-for-2 and scored no points in four minutes in a 92-73 loss that became a part of Puerto Rican basketball lore. Anthony went on to win a gold medal for the U.S. in 2008 and is on track to play in this summer's Olympics in London. Melo's legacy will also be determined by how well he fulfills the immense expectations that come with being New York's go-to guy in the pursuit of the Knicks' first NBA title since 1973. "Oh man, that would put the candle on the cake right there," he said of a championship parade in Manhattan. "I'm looking forward to it and I'm working hard to get there. That's the ultimate goal. I want to leave my mark in New York."